New York based designer Sandy Chilewich is founder and creative director of Chilewich | Sultan LLC, a company managed with her partner and husband Joe Sultan who serves as CEO for the company. For the last three decades, Chilewich has reinterpreted under-utilized and overlooked manufacturing practices. Since 2000, Chilewich has designed innovative textiles for numerous applications. Sandy launched placemats and floor mats with her original signature textiles in 2000. Chilewich designs have transformed the way tables are dressed in homes and in restaurants around the world and their floor mats provide a clean modern alternative underfoot. These Four Walls is proud to carry this line. AND HOW THEY ARE MADE. Chilewich creates innovative products from our own original textiles which enhance interiors around the world. Using woven vinyl textiles, Chilewich manufactures designs which include flooring, wall textiles, upholstery, window covering, tabletop designs and more. They use vinyl because it is durable, it’s easy to maintain and provides the aesthetic qualities their customers' desire. Chilewich’s woven textile products can be washed with water and bio-degradable detergents and have a long lifecycle, which helps customers reduce both energy use and costs, while maintaining a unique and elegant setting. 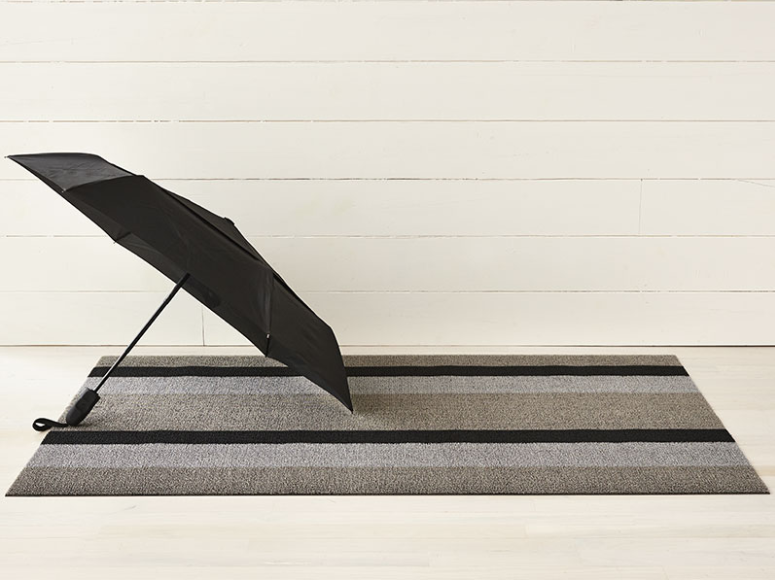 Hardworking, beautiful and functional, Chilewich shag mats are ideal for use in kitchens, bathrooms, mudrooms, outdoor terraces, patios, pool areas + entryways. Easy to clean: Shake out, vacuum or hose down with water and hang to dry. Mold, mildew and chlorine resistant. Quick drying. Chilewich shag mats are tufted for a textured "looped" look then bonded to a durable vinyl backing. Explore the full Chilewich collection of durable indoor/outdoor floor mats below and at These Four Walls in Grosvenor Square. Mats are available in a wide array of styles + colours and will enhance any interior or exterior spaces while providing functionality underfoot. Please note that some colours are available in select sizes only. Made in the USA. Phthalate free. For additional information and to order, please visit or phone These Four Walls at (204) 452-5786.